The Retro Café Racer, Scrambler, 1960’s bike fashion revolution is running stronger than ever and that means we’re getting more off the shelf bikes that look more custom built than ever. 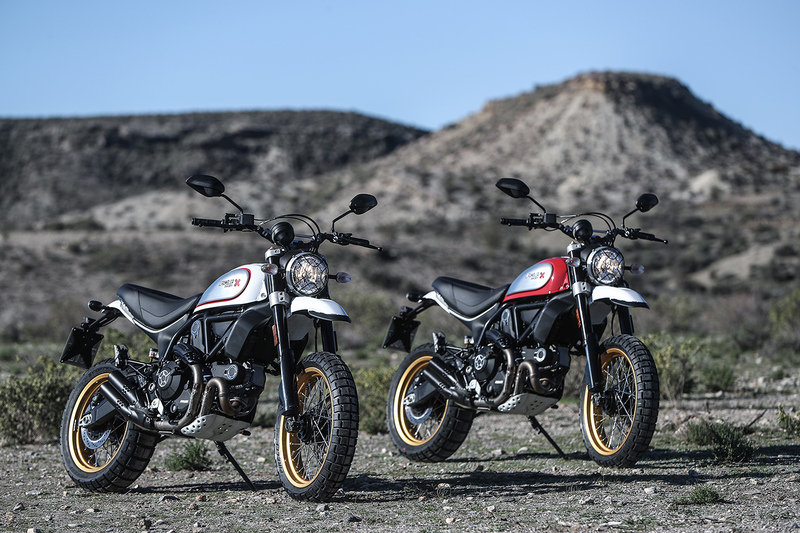 Ducati have re-styled and upgraded the Scrambler line for 2017 with the new Desert Sled model. We sent Llewelyn Pavey into the desert to see what all the fuss was about. 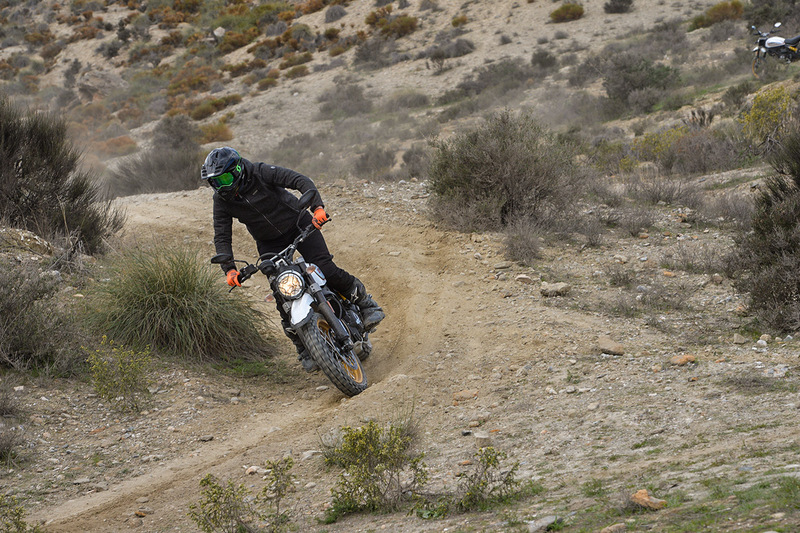 The Scrambler of 2015 and 2016 is a solid bike. It’s not great but it is good. The price was fair, the styling was both Ducati, retro and inoffensive and it was likeable. It had some quirks that left me wanting a little; the suspension felt cheap and harsh and the power delivery from roll on was as abrupt as Ducati could make it. 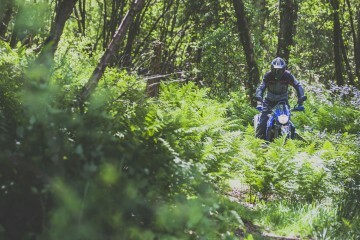 Despite the off-road styling of the Enduro version, it wasn’t an off-road capable bike. It could uncomfortably bob down a dirt road but that was it. Now 2017 is here and we’ve entered into an age of more severe emission rules. The Desert Sled is a Scrambler that has been re-tweaked and beefed to let you ride off-road in a throw back to the late 60’s when off-road bikes were road bikes that had been adulterated in a workshop. Just like those desert smashing bikes to which the hipster revolution is paying homage, the Scrambler Desert Sled has been under the angle grinder too. It’s the same bike with the same engine and basic frame but a lot of the bits around it are new. Don’t mistake changes as making a new bike. It’s not a new bike but it is different. The biggest change is the suspension and wheel size combo. They went bigger on the suspension, stretching things out to around 200mm of wheel travel at both ends. That’s more than KTM’s 1190 Adventure and a BMW R 1200 GS. 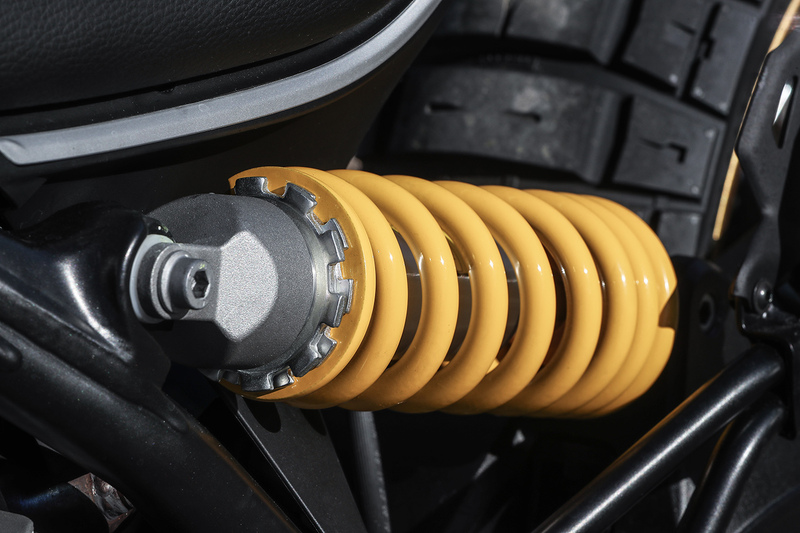 The components of the suspension are entirely new too. 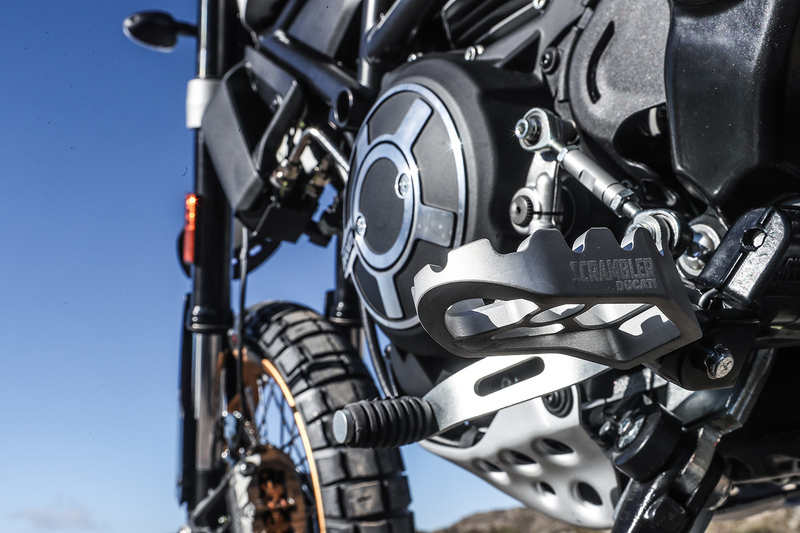 They’re a much higher spec than the standard scrambler, offering a fully adjustable fork and a rebound and preload adjustable shock. That also means a new triple clamp design to keep the rake and trail and thus the handling as similar as possible to its little brother. With that increase in travel, the seat height has bumped up to around 860mm (optional 20mm lower version available). They narrowed the front of the seat to make getting a foot down easier in response to that. We can imagine a set of soft pannier draped across the back. Simple cockpits and strong bars. The upper shock bolt is different on the production models. The wheel size has gone up at the front to a 19-inch wheel and the rear tyre is a little narrower. 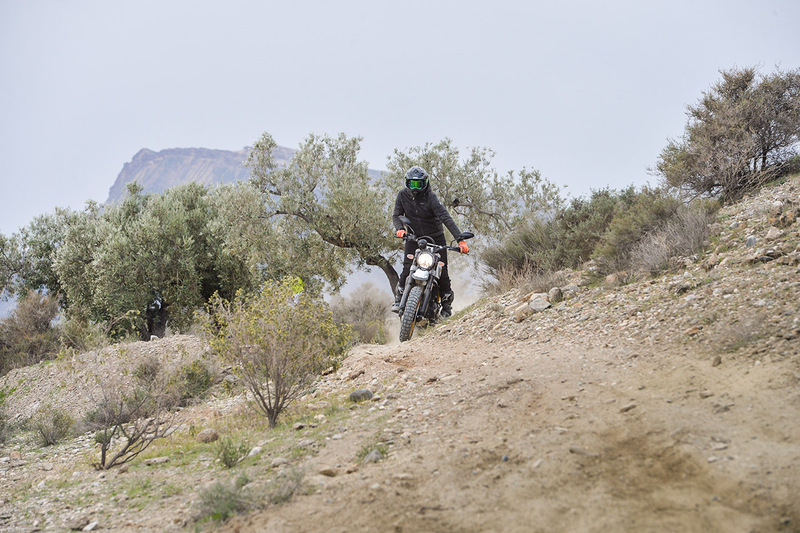 The 19-inch is intended to make it work better on the dirt and is a pretty common size on adventure bikes for its all round friendliness. 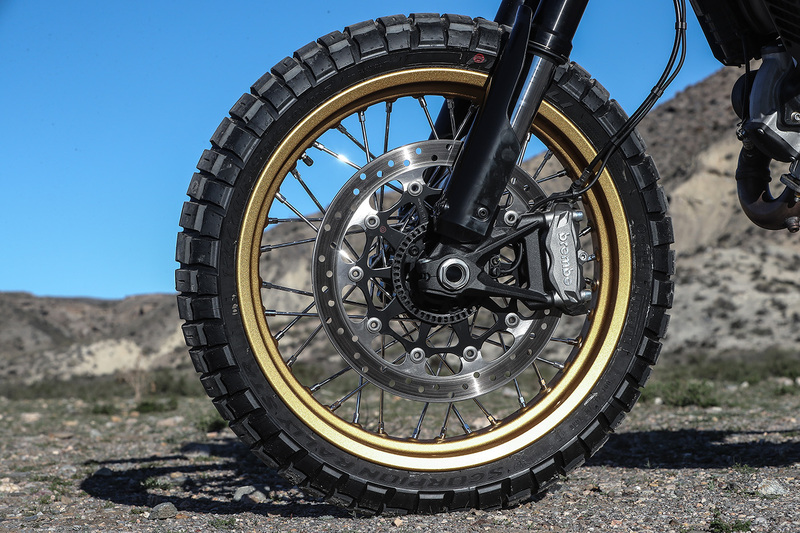 Ducati and Pirelli also worked together to develop a new, extremely good looking version of the already good Scorpion Rally tyre to fit the Desert Sled as standard. The rest of the chassis has also changed. They’ve beefed the frame up around the engine/swingarm mounts to take more of a pounding. 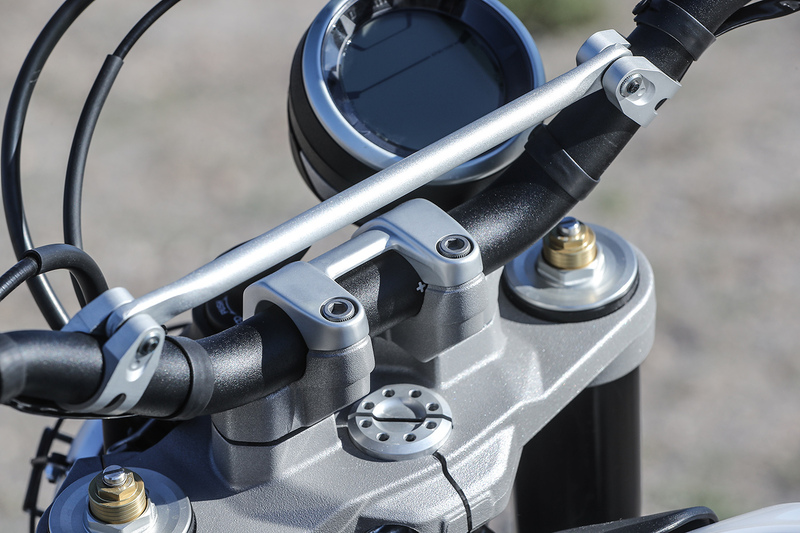 The swingarm is now 25mm longer and the relationship between the footpegs, seat and handlebars is completely different. The bars are a more off-road design with a cross brace and the weight is up to a beefy 191kg thanks to all the heavier, more expensive bits. The last step on the list of changes is to fit the Euro 4 emissions regulations. We’ve now got some filter thing that helps with emissions but Ducati claim that the power and torque from the 2017 model is identical. More importantly, they’ve added a shaped cam in the throttle to improve the delivery and reduce the slightly unnerving surge of the previous year. Off road footpegs were fitted to our test bike. What that list of changes boils down to is a bike that is both the same and very different. The platform is identical but the changes make subtle improvements to the whole package. Right from the get go, riding out of the Western Film Set the launch was based at, it feels incredibly comfortable. Ducati’s direction with this bike was to produce something that was capable of being ridden in the dirt comfortably. 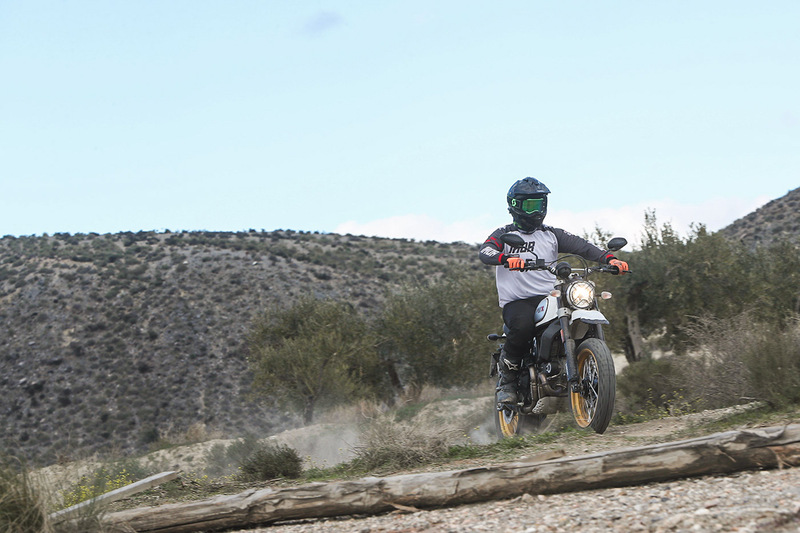 It turns out, the Italian brand are becoming quite adept at making the changes required to make good off-road bikes and just like the Multistrada Enduro (LINK) the Ducati Desert Sled is more adept than it has any right to be. The riding position really helps with this and it’s something they’ve gotten pretty much perfect. It’s quite an upright position compared to a lot of other dual-sport bikes but that makes it comfortable. The bars are wide and very nicely placed relative to the footpegs and the seat. It seemed to work for everyone, including myself at 6’2”. Being of a taller design, the cockpit is a big improvement for a larger rider when sitting down too. It’s not at all cramped and even over three or four hours in the saddle it was perfectly good. The riding position is very comfortable. 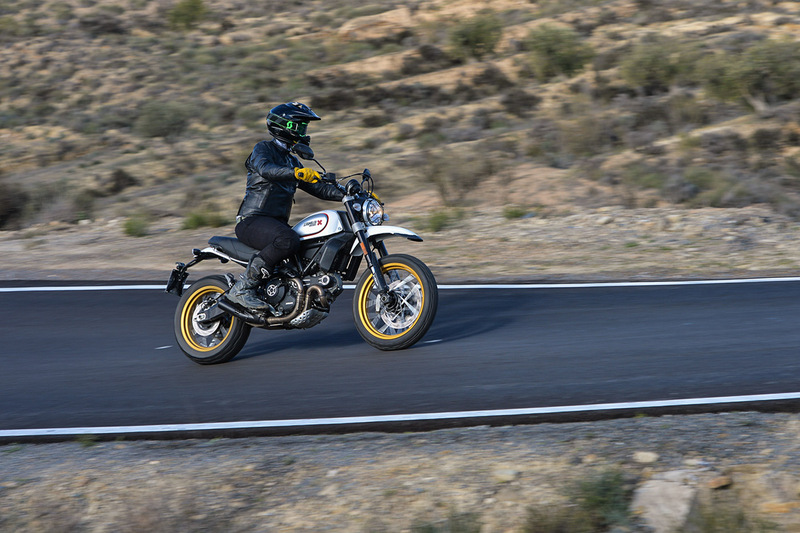 Having a great riding position is the first step to making a bike work well but what Ducati seemed to have improved most is the way the scrambler carries its weight. It’s gone up in weight a large amount and yet in hand it doesn’t feel heavy to ride. The off-road trail manners are very good. It’s quick to change direction on the trail, it’s stable and doesn’t swing side to side like you’d expect a road biased bike to and is without doubt easy to manage. It was more than easy enough for relative off-road novices to tackle the sandy river washes and mountain dirt roads without an overwhelming fear of crashing or dying. The change in the throttle response at roll-on is also a huge improvement. Ducati say this is going to be the same on all of the bikes and this is without doubt the best update to the Scrambler line. It rolls on as you’d expect a bike to and has subsequently enhanced the corner exit capabilities and slow speed riding. 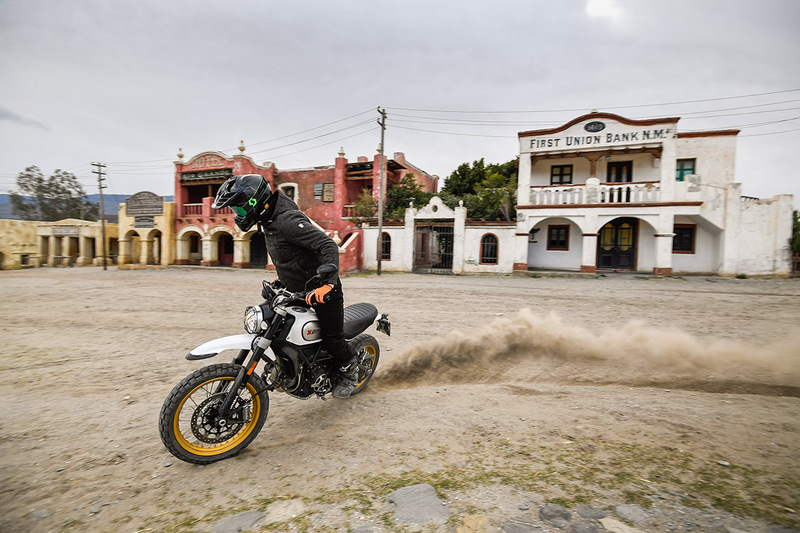 The changes to the Ducati Desert Sled that were implemented in the name of off-road seem to have improved the general riding manners of the Scrambler too. 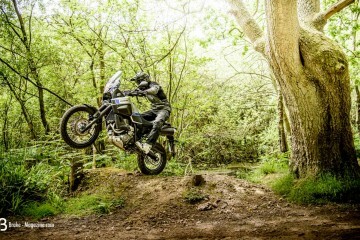 The upgraded suspension has had a sizeable impact on the ride comfort and handling of the Scrambler. It no longer feels harsh or cheap. It doesn’t translate unnecessary feedback and the control of the damping is much improved. The suspension is equally good on and off-road, feeling like a quality KYB unit that cost more than a bag of Walkers crisps to make. On the dirt it’s comfortable with small jumps, bumps and rocks. On road it holds firm and steady in corners, not wallowing around or smashing you in the back when you’re lazy with speed bumps and that makes for a really nice ride in the real world. The road handling characteristics have also changed a touch from the little brother. It still feels very similar, tipping into corners with the same manner but it does it a little easier. The big handlebars help with that; a huge amount of leverage always helps with that. Sometimes the front end felt a little vague on the road but it wasn’t a feeling that particularly bothered me, mostly because the whole nature of the scrambler doesn’t urge you to push the envelope. The engine is also pretty good. The 800cc V-twin isn’t packed with big numbers, pushing out a comfortable 75hp, but it does the job. It’s a torque filled, surging engine rather than something that’ll drag you to land speed records but it pulls out of corners enjoyably enough. It does have a habit of convincing you it’s bigger and has more torque than it really does and for the first 20 minutes on the road I was repeatedly in too high of a gear. It doesn’t pull tall gears well and as soon as you clock onto that and rev it a little bit more it feels punchy and enjoyable. The engine is not ground breaking or earth shatteringly good but rather functional, smooth and pleasant. No bike is perfect and neither is the Scrambler. There are a few little niggles here but for the most part the Scrambler Desert Sled is a well finished bike. Most of the components are stock Ducati fair. There was a small issue with a protruding shock bolt but Ducati informed us that our bike was pre-production and it has been rectified on production units. The only minor complaint I managed to form over the day was with the rear brake pedal. The shape and bend feels like it places the pedal tip too far to the right of the engine case. It meant that, when riding stood up especially, I caught it on the arm rather than the tip and would regularly apply more brake than I intended. It’s a small, easy thing to fix and you’ll likely get used to it after a few rides but on the day it bugged. On paper a Scrambler seems like an unlikely choice of bike to travel on. It’s a bike designed for looking cool, cruising around and fitting a fashion mould. Yet, Ducati have inadvertently created a bike that frankly, would make an awesome bike for travel. After all, it’s pretty good on the dirt and the tarmac. It’s a balanced package that’s unintimidating in most general riding conditions. It eats dirt roads and trails comfortably, bobs along the road at a decent speed and is pretty comfortable. Secondly, it’s just over 200 kilograms. That instantly makes it lighter than a huge amount of other full sized ADV bikes. The weight is reflected in both the ride and the handling too. It’s pretty easy to move around, light and very well balanced in hand and that makes it generally a friendly bike. The ride is also very relaxed. 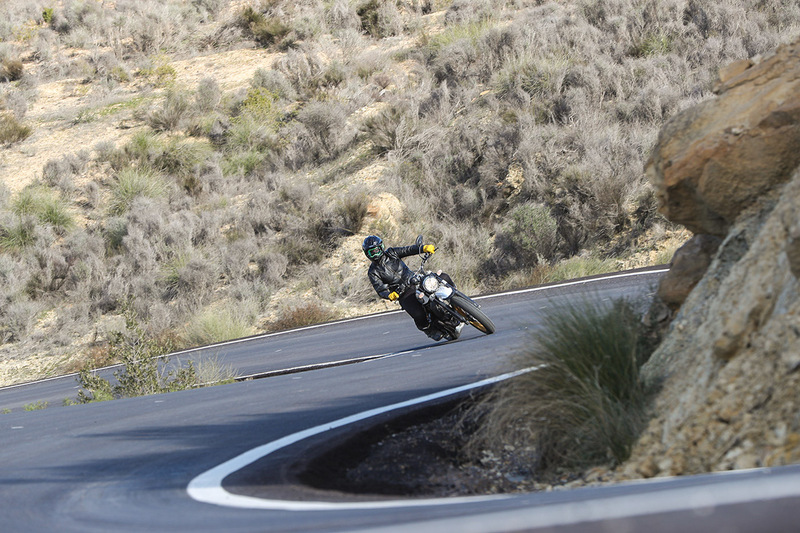 The scrambler won’t encourage you to push your limits and ride fast. It’s a very different riding experience to a lot of the big end ADV bikes. It’s designed to be capable but relaxed. 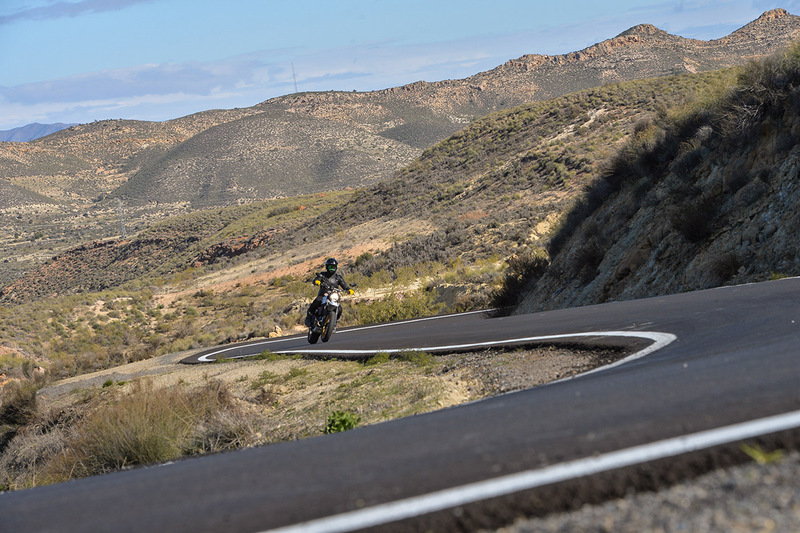 That approach and way of riding is great for Adventure riding. Making the pace slower and enjoyable creates a very different experience. It’s something unique among modern machines, bikes that are becoming higher and higher performing all the time. The last point that inadvertently makes the Desert Sled a potentially fantastic adventure machine is the styling. It’s the antithesis of the big, beastly, futuristic styling of a R 1200 GS and KTM Super Adventure. It’s small, neat and looks surprisingly similar to an old Yamaha XT 250. The subtler styling has the ability to let you blend in a little more and become a little bit less like an alien from outer space. It doesn’t have any wind protection. It also doesn’t have great engine protection out of the box or any form of pannier rail but all those are solvable problems. What Ducati have actually created in the quest to sell the hipster lifestyle is a fantastic all round bike. It’s a bike I’d happily ride to the shops and ride to work. I’d go for a weekend ride on it, hit some trails and I’d sure as hell go on a chilled out holiday ride somewhere. Don’t get me wrong, I don’t plan on busting thousands of motorway miles but it really do almost everything and does so better than a lot of other ‘adventure’ bikes on the market. If you’re reading this with the thought of buying a Desert Sled, I’d put money on that being because you like the bike. You like the aesthetic and everything that comes with the package. If you’re that person then the Desert Sled is a bike you’ll love. It does everything Ducati want it too and nothing more. It looks great, it rides well, the engine is nice, the suspension better than before and it can now actually be used in the dirt comfortably. What it isn’t, is exceptional. It’s a much nicer bike than little brother to ride, the suspension is better, the handling enjoyable and the ride comfort much nicer. 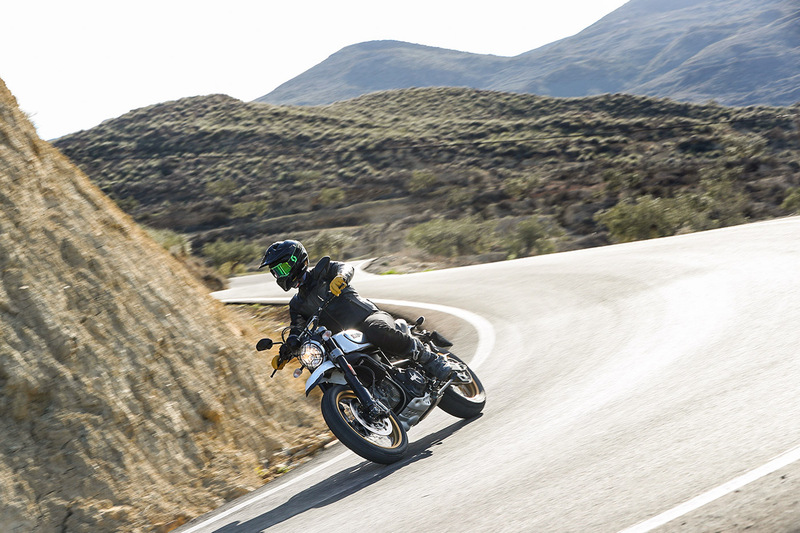 If that sounds like a bike you can buy into, if you’re not looking for your eye balls to be moved to the back of your skull when you accelerate or to scramble to the top of every mountain across the Alps, then the Scrambler Desert Sled could well be the bike for you. It’s capable, just not limit pushing and that is in no way a bad thing. 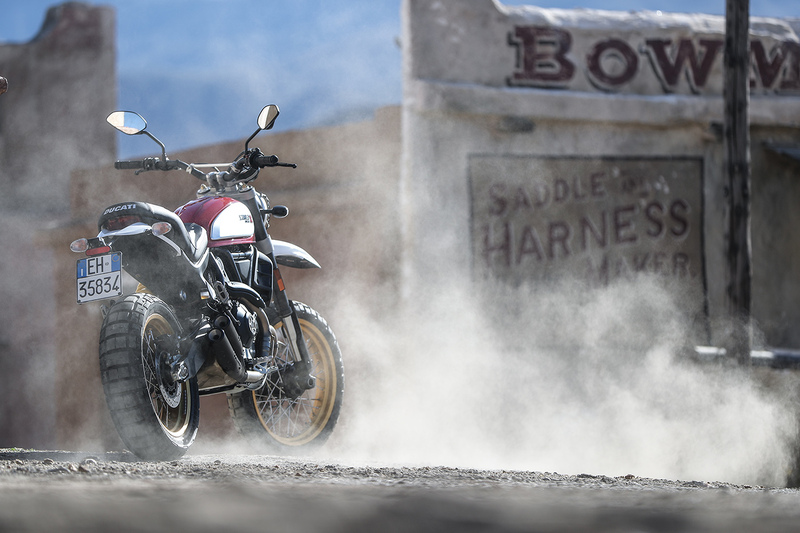 For more info on the Desert Scrambler Desert Sled click here.